Scholar, actress, director, writer, curator and dramaturge, Narges Hashempour has been involved in various international theatre projects and festivals since 1991. These include: SALONe TEHERANi. Privates und öffentliches Leben im Iran, (Dresden, 2011); Ich Und… (Berlin, 2008); Songs for Her (Stuttgart and Mühlheim, 2006); Scheherazade im Flughafen (Stuttgart and Pforzheim, 2005); Unwritten Whisper (Tehran, 2003, and Berlin, 2005); The House of Bernarda Alba (dir. Roberto Ciulli, Tehran, Mühlheim, Berlin, Stockholm, Stuttgart, Lièges, 2001); and Nameless Maria (Tehran and, Mühlheim, 2000). 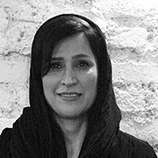 She is the recipient of several prizes, including the 2001 Gordana-Kosanovic-Prize for Outstanding Acting awarded by the Theater a. d. Ruhr in Mühlheim, and numerous academic and artistic grants and fellowships, such as the Erasmus Research Fellowship for her dissertation entitled “Traditional and Modern: Iranian Theatre Culture and Gender Performance” at Freie Universität Berlin (2009-2012); a grant from the International Research Training Group InterArt Studies (2012); and a DAAD (2007) as well as an Akademie Schloss Solitude Fellowship (2005-2006). Hashempour has also been an associated member at the “IZ Geschlechterforschung” at Freie Universität Berlin (2011), a member of the International Research Training Group InterArt Studies (2007) and a member of Iran Theatre House (1999).